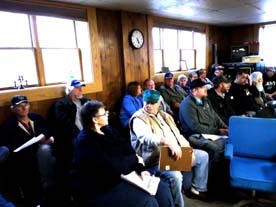 Vanessa Dietz/Daily Mining Gazette SynSel Energy plans to employ hundreds at an advanced biofuels plant on the site of the former Smurfit-Stone Container paper mill in Ontonagon. ONTONAGON — Plans to construct an advanced biofuels plant in Ontonagon next summer are moving forward. Ontonagon’s Lost Bowl Development partnered with SynSel Energy Inc. and a U.S.-based financier to develop a $300 million biorefinery on the site of the town’s former Smurfit-Stone Container paper pill that closed in 2010. SynSel, of Elmhurst, Illinois, plans to build an identical $300 million plant in Lumberton, Mississippi. Each plant is expected to yield about 250 direct and indirect jobs. 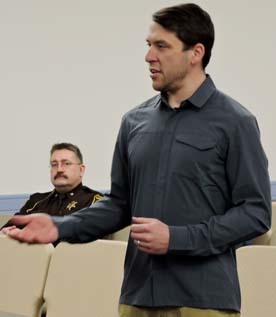 “We are honored to be partnering with SynSel and their financier to help revitalize this county with good paying jobs,” said Pat Tucker, member of the Ontonagon County Economic Development Corp. and president of Lost Bowl Development, current owner of Smurfit-Stone Paper Mill property. Bound by a confidentiality agreement, Tucker declined to name the company’s financier. The new plant will use the excess waste wood generated by area logging to produce its renewable biofuel. Tucker said fuel generated directly from the plant can be used in place of gasoline and other fuels and is less harmful to the environment. “The fuel produced by SynSel can be drop-in ready and is able to directly displace petroleum-based fuels without engine modification or degradation in performance,” Tucker said. “We will be producing a combination of synthetic gasoline, diesel and aviation fuel for sale in the commodity markets and the Department of Defense. Construction funding for both plants has been committed by SynSel’s financier and business partner as the company secures construction project deposits. Tucker expects construction of the plant will start next summer. He said a second phase of the project will create an energy park, where it is estimated that an additional 200 jobs will be created. “The biorefinery will serve as the development anchor, and other businesses will be able to take advantage of process waste byproducts like heat to decrease operational expenses. It becomes a win-win-win situation for the business partners the community, and us,” Tucker said. “We are eager to engage with state, county and community leaders and stakeholders at the appropriate time in the near future,” SynSel CEO Tim Tawoda told the Ironwood Daily Globe.